Since the inception of the Bibliographic Bunker, I have been writing about artists’ books and the book as an object. The interview with Malcolm Mac Neill and his memoir Observed While Falling were revelations. Both reinforced my belief that the concept of the book in all its facets was central to Burroughs’ creative and ideological pursuits. From Naked Lunch when Burroughs’ difficulties in physically creating a manuscript from the heap of papers on his floor mirrored his struggles with the novel as a form, the book as an object fascinated and haunted Burroughs. This is probably true of all writers but given Burroughs’ thoughts on the power of text and image the concept of the book looms larger over Burroughs’ work. 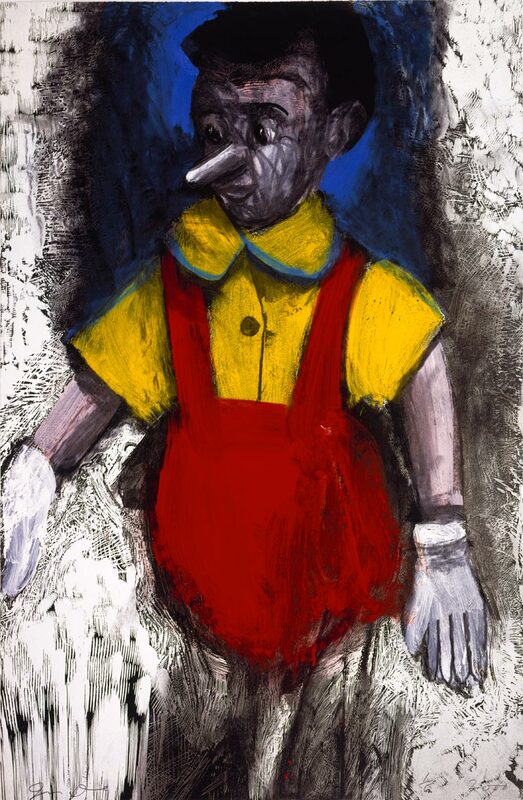 A few weeks ago, I heard about an exhibition of the recent prints of artist Jim Dine on display until early December at the CUNY Graduate Center. Dine rose to prominence in the 1960s in an era of great change in the art world. Pop, Op, conceptual, Fluxus and minimalist art all flourished in the period. I looked over the exhibition and was struck by three livres d’artiste featured in the show: Ape and Cat, Pinocchio, and Kali. From childhood, the book as an object has influenced and inspired Dine. For decades now, he has been at the forefront of exploring the artistic possibilities of the book as a form. Here was an opportunity to interview a major visual and textual artist about art and the book. These are issues dear to me and, if Johanna Drucker is correct, central to 20th Century art. Not surprisingly, Dine has thoughts on such assessments, although his conclusions may surprise. Like Burroughs, Dine focuses on the concept of the book and the book remains central to his artistic concerns at present. This interview explores a full range of topics from his childhood experiences with the book to the role of the New York School as an inspiration and influence to the possibilities of handwriting as art and expression. The results of the interview come from years of hard work and hard thought on these topics. As I have said, Dine is a giant in contemporary art (I remember attending his exhibition at the National Gallery in Washington DC in 2004) and this interview is an articulate and introspective account of nearly a half century of constant activity. Though they were contemporaries sensitive to the artistic possibilities of the book, Dine sheds little direct light on Burroughs. However, his thoughts on Burroughs’ work are a must-read for those in the forum looking for criticism on Burroughs and a sense of how he was perceived in the 1960s. They also provide a snapshot of a major figure’s ideas on the book in contemporary art. By gathering these snapshots a composite, like Ian Sommerville’s photo experiments that graced the cover of the Olympia Press edition of The Ticket That Exploded, can be created that reproduces the era out of which Burroughs’ concern with the book developed. The catalog to Selected Prints: 1996-2006 mentions the importance of books to your art. I want to sidestep a book’s importance as narrative and focus on the book as an object and technology. How does the book as an object play a role in your work? The book as an object has always been my only interest in making a book. The narrative, no matter what it is, long or short, written by me or the “Old Testament” is a given but to make a book (BOOK) is my primary goal. Are there any particular books that influenced or inspired you on the level of design and format? Since I have been inspired by objects of all sorts all my life, books inspired me for themselves (individually) since I was aware of them. I remember used textbooks in elementary school with someone else’s notes in the margin as objects of mystery. The same with library books and other peoples’ names in the back. I loved it when someone, other than me, “defaced” a text book, ie, a Latin grammar. It brought the page alive. In The Century of Artists’ Books, Johanna Drucker states that the artist’s book (livre d’artiste) is the quintessential form of 20th Century art. Given your work in this area, do you have any thoughts on that statement? I think Ms. Drucker must be nuts or just self-serving for her own book. No one cares about artists’ books except a handful of collectors and, of course, a handful of artists. The death of the book has been much prophesized as we move forward in the electronic / digital age. What do you see as the future of the book? What is the books future in the world of art? Is the recent interest in the book as object a fetishistic response to the disappearance of the printed book? No idea about the death of the book. Around my house it’s very much alive. I am in the midst of doing 52 Books that is a book a week for a year. The book’s future in the world of art is rather thin since the world of art becomes more and more commercial and more and more like the stock market. I am afraid there is no $ to be made. I am not aware of a recent interest in the book as an object any more than there has always been or not. Let’s look closely at the artist’s books in this exhibit. Ape and Cat has an accordion design. 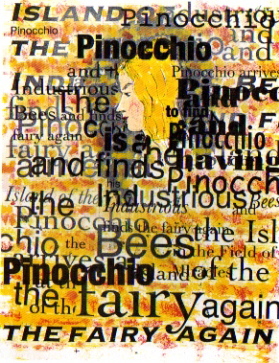 Pinocchio utilizes a wooden box format. How do the formats of these books reflect the content inside and the themes of the artwork? This question suggests a separation/independence between form and content is possible. Is this false? Charles Olson’s statement (via Creeley, with whom who you have worked) “form is an extension of content” comes to mind. The Pinocchio was put in a rough wooden box because of the relationship of the boy and his maker to wood. After all, he started his journey as a “talking stick.” It was not bound but stacked in the box like a classic French artists’ book so that it could be enjoyed cinematically or in any variety of combination of images. Ape and Cat was printed as an accordion because Arion Press had some mannered idea about form that I was unable to kick against as my personal life at the time was falling apart. In the end, he did it so it displayed well at “art fairs.” It made no sense with the romantic content. I am particularly drawn to the Pinocchio book. I see elements of Dada (in terms of typography) and Pop (in terms of image), but I also see an element of Fluxus with the interplay of typography and image? The collage work of the Fluxus artists comes to mind. Speak of the influences and inspirations for this artist’s book. 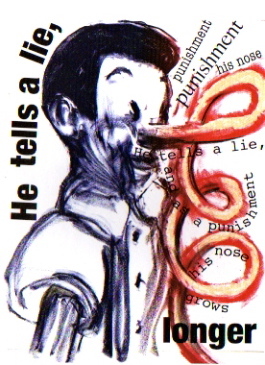 Pinocchio except for Biotherm (more about this later) is my most inspired work for a book with original prints. Lithographs. I don’t feel the slightest bit of admiration for any Fluxus work except Emmett Williams‘ small book from the 1960s Sweethearts. The rest was warmed over Dada via Cage (John). The method of adding the typography was dictated by the printing process. Michael Woolworth, the printer, is a curious master of mylar transfers from the sheet to a plate via a carbon light. A very primitive method but very useful for me as an old collagist. I was also able to reinvent the chapter headings my way into my poetic interpretations of Collodi’s text (translated). 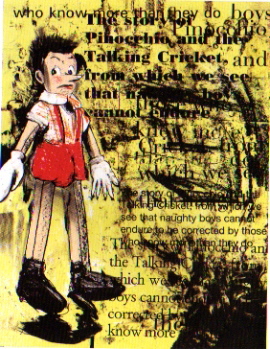 I got a lot of ideas from the way to depict the boy from close observation of my Pinocchio dolls. I was able to invent from them and from the storm in my head. When I think of the interplay of word and image, William Burroughs comes to mind. Are you aware of Burroughs collage, cut-up and scrapbook work from the 1960s and early 1970s as exhibited in the Ports of Entry show? This work seems similar to the Pinocchio piece. Any thoughts on Burroughs’ as a visual artist? Given the importance of literature in your work, has Burroughs as a writer had any effect on you? You lived in New York City and London at the same time as Burroughs in the 1960s. Did your paths cross? Was he a visible presence in those cities? Any memories of him there? I was always aware of his cut-up work with Brion Gysin. I found it forced and very empty. Visually nothing for me. Not amazed by content or the cut-up form. I guess you can tell I am not a Bill Burroughs guy. I saw him once at a big party in London in June of 1967 which is where I saw the before-mentioned Barry Hall of Cape Goliard. None of his (Burroughs’) work has ever amazed me period. Dieter Roth, a King of the book. Everything he did was a great invention done out of humor, sadness, and alcohol. Now he was a Book-Maker!! I am interested in your book This Goofy Life of Constant Mourning. I find the role of handwriting in art and the artist’s book to be intriguing. Looking at the cover to the book, many associations flashed through my mind: Robert Grenier’s handwritten scrawl poems/pictures, Cy Twombly’s use of handwriting, or even the City Lights publications of Lawrence Ferlinghetti that feature his handwriting with a magic marker (Like the cover for Journal for the Protection of All Beings for example). Can you talk about the act/process of writing and handwriting in your work? Is there a tradition in this line you are reacting to with Goofy Life? I actually met Grenier once at my then house in Vermont about 1976. He figures in a memoir I’ve written about my life knowing Creeley. I have never seen or taken in his handwritten scrawl poems etc. I wanted to make a digital photographs. I met a guy called David Adamson who has a digital photo studio in DC. I would go there and he gave me a room about 15′ X 10′ with a 4′ X 5′ view camera with a beautiful lens and a digital back. I would set up objects and write poems on his walls or over the objects and arrange the words and objects in some homogenous way. I would then photograph them and David Adamson would print them like 6′ X 4′ or thereabouts. I have always had a relationship to my handwriting and my hand. The Goofy words are details of these images and they had been scanned from the original Adamson digitals by Steidl in Gottingen at his digital darkroom for my then catalogue raisonné of my photos called The Photographs So Far. I took the scans and in my “procrustean” way cut them to fit the Goofy book. You can read it as a tale of a sad time in my life or just look at it as calligraphy on a page. I would like to focus on one Arion Press publication that has always interested me: Frank O’Hara’s Biotherm. Can you go into some detail about this work in terms of how it came about, the relationship of form and content, the importance of O’Hara and the New York School to you as an artist and writer? Did previous livres d’artiste involving O’Hara (I think of Larry Rivers and Jasper Johns) come into play in Biotherm? I wanted to do two books at once. Apollinaire’s Zone and Biotherm. Hoyem only went for Biotherm. Too bad. I pinned mylar on the walls of my studio that summer and simply responded to Frank’s text in a free associative way as it came up in the poem. It was done in less than a week and poured out of me the way images flash for one when the engine is stoked. O’Hara was and is one of my favorite poets. I have a lot of romance about the era he writes about. I was an art student in the late 1950s; also his casual way of pathos gets me. You speak of your love of O’Hara’s work. Can you speak about O’Hara as a personality or about his role in the world of art (curator, critic, etc)? Did O’Hara (outside of his poetry) have an effect on you? For example how he approached art or life in general? From what I have read, he casts a large shadow on all aspects of New York creative life in the 1950s and 1960s. Frank O’Hara was a great champion of “the New York School of the 50s.” He was a great champion of New York Bohemia in the 50s. He loved Balanchine’s ballet and jazz at the Five Spot etc. He understood the glamour of New York in the 50s after the European surrealists went back home and before Pop Art ruined what was New York 50s glamour. Saying all that he tried to be always up on stuff (in the 60s) but I know he was on a treadmill in society and not really understanding what we were really doing. He once wrote an essay about Oldenburg and me and Red Grooms, maybe others. He got it wrong. Saying that, I keep Lunch Poems by my bed. It still and always gives me pleasure and like a “madeleine” I can taste October 1958 very vividly. I am curious about the New York School’s relationship to art. Do you see a simple division between the First Generation (Ashbery, Koch, O’Hara, and Schuyler) and the Second Generation (Berrigan, Padgett, Waldman, Warsh et al) on the basis of the art that surrounded them? For example, the First Generation is surrounded by Abstract Expressionism and Berrigan / Padgett / Waldman / Warsh is First Generation meets Pop Art. What are your thoughts on art and the various generations of New York School poets? NY School of Poetry’s relationship to art in my experience was totally accepting. Since there was no money to be made with poetry it didn’t have any jealousy with painters and sculptors. Just ego. That can be huge too but unlike the jealousy between artists once success has been attained by one and not another these people were merely inspired by our work and were inspiring themselves as poets. I loved all my friendships with poets. I learned a lot from all of them about myself and the American Language. Does O’Hara and Company speak more powerfully to you as an artist / poet than Berrigan and Company? Did you have more of a relationship (social or creative) with one generation or the other? I see Kali features your poems and etching. What artist besides yourself would you like to work with your poems? I am married to the writer / photographer Diana Michener. We speak of collaborating a lot and probably will this winter in my 52 Books. Her book, Dogs, Fires, Me (Steidl Verlag Publisher) really inspired me. We made a small book together called 3 Poems also published by Steidl with our photos and a poem written by us both. In a similar line, what is your dream artist’s book? For example, Brainard / Berrigan or Jeff Nuttall doing a deluxe mimeo of Lewis Carroll’s The Jabberwock. Or maybe a cave painter (or in a more modern vein, Robert Smithson) working with Gary Snyder’s work? Any dream pairings or project you would have liked to see? Written by Jed Birmingham and published by RealityStudio on 14 November 2007. 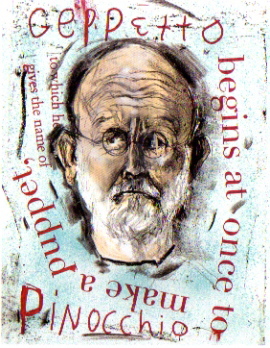 The exhibition of Jim Dine’s prints is on view at the CUNY Graduate Center in New York until 8 December 2007. Also see Jan Herman’s “rant” about the exhibit.